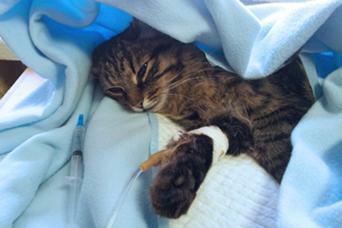 Feline infectious peritonitis (FIP) is a fatal, viral disease that currently has no cure. Depending on the form it takes, it affects the functions of a cat's vital organs, eventually leading to the animal's death. While nearly any cat is at risk of developing FIP, there are some common risk factors to be aware of. According to the Cornell University College of Veterinary Medicine (CUCVM), feline infectious peritonitis is caused by feline coronavirus. For reasons that have yet to be determined, either the coronavirus mutates or something goes wrong with the typical immune response to the original coronavirus, resulting in production of the FIP virus. The virus is then transported throughout a cat's body via infected white cells. Beyond those signs, each form of the virus produces its own specific symptoms. The cat develops a swollen (fluid-filled) abdomen. The animal displays labored breathing, which is caused by the fluid buildup. Kidneys: The cat is constantly thirsty and urinates a lot. Liver: The cat develops jaundice. Eyes: The eyes become inflamed. According to Wendy C. Brooks, DVM, DipABVP, diagnosing FIP can be particularly difficult because the outward symptoms are common to a number of diseases. There is no definitive test for FIP at this time, so veterinarians usually test an affected cat for prior exposure to coronavirus (FIP titer) to see if the results will support a diagnosis of FIP when combined with the cat's symptoms. Albumin to globulin ratio: Globulin levels tend to go up with FIP, while albumin levels tend to go down. Serum protein levels: These levels are typically high in cats that have FIP. Tissue biopsy: This test is rarely used since most cats with FIP aren't good candidates for the procedure. A tissue sample is stained to look for the presence of coronavirus, and there will only be enough evidence of that virus if the cat has FIP. There is no cure for FIP, so treatment usually consists of making an affected cat as comfortable as possible. This includes treating individual symptoms, but the disease worsens regardless, and the cat will either die on its own or be humanely euthanized. Dr. Pedersen lists several risk factors that increase a cat's chance of getting FIP. Overcrowding cats, such as what sometimes happens in shelters, catteries, and multi-cat households, increases the risk for FIP due to the likely increased exposure to coronavirus. 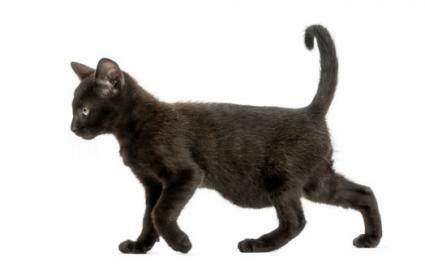 Unclean conditions, which contribute to more coronavirus in the cats' environment and, therefore, greater risk that one or more cats will develop FIP. Genetic inheritance is also a factor since the disease appears more frequently in certain breeds, such as Birman and Burmese cats, as well as certain bloodlines. According to Dr. Brooks, even though coronavirus is contagious, the FIP virus that develops from the coronavirus is not contagious because cats don't shed it into their environments. The virus is also not contagious to humans or dogs. According to the ASPCA, there is an intranasal vaccine for FIP, but it's not recommend by the American Association of Feline practitioners since it's only effective on cats that test negative for coronavirus antibodies at the time of vaccination. Since coronavirus is so common, many kittens are exposed to it before they are old enough to be vaccinated, which would render the vaccine useless. Although a cure has been elusive so far, ongoing research by UC Davis and other organizations may one day produce a more effective vaccine, as well as medications that could slow down the virus. With a lot of work and a little luck, FIP may one day become a threat of the past.